It is during Holy Week that Christianity most closely resembles an ancient pagan mystery cult. The teachings associated with Jesus Christ, the parables and injunctions to neighbourly love, largely give way to a drama of sacrifice and redemption, as his final days on earth, violent atoning death and triumphant (though obscure) resurrection are ritually re-enacted in story and music. More than a commemoration of supposed events in Jerusalem not quite two thousand years ago, the days leading up to Easter present an intensely mythic lesson about the human condition which followers of Osiris, Dionysus, Mithras or Attis would have recognised - even if they would have considered an itinerant Jewish preacher, executed as a troublemaker by the Roman authorities, an unworthy focus for the great cosmic drama. That may have been the masterstroke, of course. As EM Butler put it in The Myth of the Magus, the Passion narrative's "humanising of what in the legends of Osiris and Dionysus had been divine mysteries made a reality of the sacrifice which staggered the whole world". The Christian version of the story survived because it was located in history, because it attached itself to a real person - and so it could be claimed that the narrative was not just mythically or psychologically true, it was also factually true. These events actually happened. But did they? Is the similarity between the myths of antiquity and the recorded facts of Jesus' life and death not just a little too convenient, a little too coincidental? Which came first, the man Jesus or the incarnate Christ - and what relationship do they actually have with each other? A book drops through the letterbox, with the publicity-friendly title Jesus Potter Harry Christ, that attempts to tackle such questions. The title, and the mildly blasphemous cover image, suggest a fairly light-hearted examination of apparent parallels between the boy wizard and the Son of God; and that is indeed how it begins and ends. The parallels are obvious enough, despite the well-known objection to the novels by some fundamentalist Christians, and at least to some extent deliberate. Derek Murphy enumerates them: Harry, half-magic, half-Muggle (but is he both fully wizard and fully Muggle, as Jesus was fully man and fully God? ), is rescued from danger at birth and brought up in secret, performs miracles, struggles with the Dark Lord, appears to die in a final battle but emerges triumphant. And so on. Some of the parallels are worked out in great detail - but as a sceptic quoted by Murphy rightly says, much of the Potter-Christ similarity can be put down to Harry "following a standard sacrificial hero archetype". That rather begs the question, though. 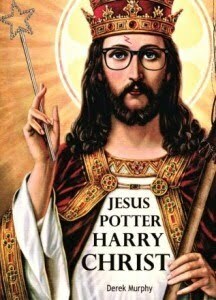 Harry Potter is no more Jesus than Luke Skywalker is, or Doctor Who - which is to say, quite a lot. The basic Jesus storyline is so fundamental to Western culture that, believer or atheist, it is impossible to ignore. It has profoundly influenced the very concept of what a story looks like. On the other hand (and despite an attempt by Murphy in his conclusion to promote Harry Potter as "a much more humane, in depth, vibrant character than the Jesus of the gospels") the young wizard is destined to remain squarely within the realm of literature and film. There will be no Potteranity (or Harry Krishnaism) any time soon. It is the reverse contention that is more intriguing - not Potter as Christ, but Christ as Potter - and it is this which occupies most of the book. In fact, Murphy says little about Harry Potter after beyond the first chapter of an almost 500 page volume, and the comparison seems to be not much more than a convenient peg on which to hang a detailed discussion of the origins of Christianity. Murphy's contention, briefly, is that the Jesus worshipped by Christians is a fictional character, who never existed (or if he did exist, is not relevant); and that Christianity is indeed a pagan mystery religion whose saviour-god has been mistaken for a real person. "The Jesus of the early Christian communities," he writes, "rather than a recently deceased historical person, was primarily a literary construct." This isn't just a case of consigning Jesus to a notional archetype of "dying and rising" gods: the New Testament writings, Murphy tells us, are coded with precise astrological symbolism that reflect now largely forgotten, but once widespread, ideas. All this is worked out at some length, and with varying degrees of plausibility. In Murphy's account, the "heretical" Gnostic versions of early Christianity, in which Jesus appeared as a mystical and usually disembodied source of arcane knowledge, were not late elaborations but rather preserved the original (but mthological) Christ-figure from which the "historical" rabbi-messiah was derived. He contends that the story of the earthly Jesus originally represented the exoteric, first-stage presentation of early Christian doctrine - a mere prelude to "higher" teachings in which initiates were presented with a more obviously unhistorical Christ. In some Christian communities, the esoteric teaching was neglected or lost; but their attachment to an imagined history gave them the edge. Their religion was less elitist, better organised and inspired more fervent devotion (including acts of martyrdom). It survived and grew, and so all we are left with today is a Christianity for Muggles. Murphy also shows convincingly that the distinction between Judaism and paganism is not as absolute as generally supposed, that there was in the Roman world a great interplay between the two (as seen, for example, in concepts such as the Logos), and suggests that the figure of Jesus represented a convenient synthesis. Such ideas are far from new. A hundred years ago, indeed, the theme was already so hackneyed that James Joyce (in Ulysses) could include Was Jesus a Sun-myth? among the Twelve Worst Books Ever Written. I've already referred to The Myth of the Magus (overlooked by Murphy) which places Jesus in a continuum of wizard-heroes - some historical, some mythical, some fictional - stretching from Zoroaster to Madam Blavatsky. The names of James Frazer and Joseph Campbell, among others, crop up frequently in this book - as do those of more recent speculative writers. Murphy demonstrates, however, that doubts about the historical reality of Jesus can be traced very early, even within the lifetime of the first apostles. The similarities between the Jesus story and those of pagan gods were remarked on by ancient writers, pagan and Christian, and adduced as evidence both for and against the truth of the new religion. Yet as Murphy admits, in this secular era the area remains academically suspect, even taboo - hence the continuing quest for the "historical Jesus". This is indeed a paradox. Edward Gibbon wrote, with typical irony, that "By the wise dispensation of Providence a mysterious veil was cast over the infancy of the church". That's putting it politely. The fact is that we know nothing whatever about either Jesus himself or about how the religion we all recognise as Christianity emerged from out the seething cauldron of myth, history and ideas. There is only guesswork. Jesus is not a historical figure like Julius Caesar, about whom some things are indeed known and others can be plausibly surmised; or even like Paul, whose personality and voice survive powerfully in the New Testament epistles. I'll repeat. When it comes to Jesus WE KNOW NOTHING. That's not to say that a huge amount of evidence hasn't survived that appears to cast light on Christian origins, though in reality the light it casts is fragmented as though refracted through a myriad prisms. There are the canonical writings of the New Testament, of course, which at least look like historical documents of some recognisable kind, even though there aren't. There are brief, not terribly enlightening allusions in Josephus and Tacitus that seem to anchor Jesus in history. There are Gnostic and other apocryphal writings that were never accepted by what became orthodox Christianity, but which reflect other ways of interpreting who and what Jesus was. There are rumours and traditions, referred to in the writings of early church fathers. There is some highly disputed archaeology. But there is nothing which can be pointed to with certainty as proving either the existence or the actual teaching of Jesus Christ. Instead, what all this wealth of contradictory material provides is an opportunity for endless discussion and debate. We may know nothing, but we can imagine anything, and can quote chapter and verse to make that anything sound plausible. The current tendency is to locate the historical Jesus in the context 1st century Palestine, emphasising his Judaism and the continuity between his teaching and earlier Jewish thought. It's possible to create thereby a plausible account of an itinerant preacher such as an original Jesus must have been. But - as Murphy points out in one of the strongest passages of the book - this can only be done by jettisoning most of the theology and mythology in which the figure Jesus comes wrapped, already in the earliest stratum of Christian literature. In other words, it requires a backwards logic: the starting point is the assumption of the very thing which the historian sets out to prove, which is that there is a plausible human Jesus to be found underneath all the theological accretions. But what if there isn't? The point is not that there was no original Jesus "behind" the myth. (Murphy's case that there might not have been is ultimately rather weak, I think, but his thesis does not in fact depend on the non-existence of Jesus the man.) The point is rather that the original Jesus is irrecoverable, and in any case is not the Jesus that Christians actually worship. Who (if anyone) inspired the paradoxical teacher of the Synoptic Gospels, the incarnate Logos of St John and the personal saviour of St Paul is a fascinating but ultimately unanswerable question. The Jesus of faith is a figure of literature and myth, who answers powerful human needs, but who has no existence outside of the Christian tradition that reveres him. I would argue that there remains strong evidence that a real man stands behind the mythologised figure of Jesus Christ - a human teacher who was believed by many to be the promised Jewish messiah. I would point, for example, to the Ebionites, a Palestinian sect who for centuries retained their Jewish observances and who did not (it appears) believe that Jesus was God Incarnate or hold other "pagan" beliefs about him. Murphy doesn't mention them. It is, though, striking just how quickly the personality of Jesus was mythologised. Paul - whose letters are the earliest surviving Christian literature, older than the gospels - shows very little interest in the events of Jesus' life, or even awareness of them. Yet his theology is already fully formed. It is almost as though Christianity came first, Jesus himself being something of an afterthought. Jesus Potter, Harry Christ - which I'd certainly recommend though it's not entirely error-free and some of the astrological claims strike me as a bit forced - doesn't seem to be available in Britain at the moment, but you can order it through Amazon USA. In addition, large parts of it are available for free download on the book's dedicated website. It's controversial, but far from outrageous, and full of fascinating, insufficiently disseminated information. Chris Patten: "terrified of doubt"
Spare a thought for the "thickos"
Encouraging news on Lords reform. Mostly.